HOW COULD I HAVE NEVER KNOWN THIS BOOK EXISTED!!!!??????!!!! IF ANYONE EVER COMES ACROSS A COPY THEY DO NOT WANT, YOU KNOW WHERE TO FIND ME. WILL TRADE SECOND BORN. SERIOUS NEGOTIATIONS CONSIDERED. Here in Baltimore, we are blessed with a bibliophile's Shangri-La known as The Book Thing. This is a warehouse filled with free books. Yes, free, take as many as you want, you don't have to make a donation, everything's free. The children's section is a series of about fourteen large blue plastic tubs that have been bolted together. The books are thrown in en masse, without any sorting. Sometimes the bins are overflowing. Sometimes they are empty. But for someone who goes every week, both Saturday and Sunday (as I do), it means my daughter has a ridiculously large library. In fact, I've recently taken at least one hundred picture books back in the last few weeks (some of which Burgin has since blogged about, which makes me second guess the decision to take them back). It is this rich plenty that throws up books that I would never have found in any other way. 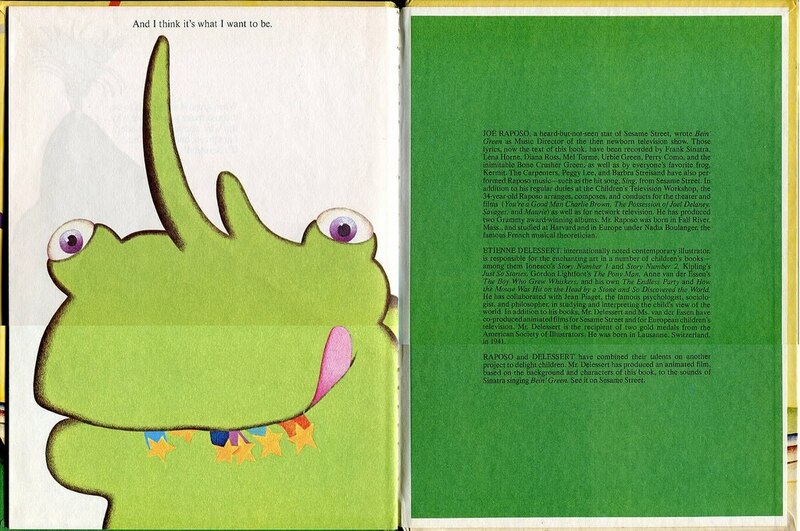 Being Green is one of those books. First, I'm a diehard Muppets fan. I've guest blogged about the Muppets here before. Second, I'm a Little Golden Books collector, so Golden on the spine, even when it's not a Little Golden Book, always makes me look twice. And third, Etienne Delessert is the artist of Eugene Ionesco's picture books, which I blogged about back in June 2010. So for all three of these things to converge, and get churned up in front of me as I dug through the children's bins was definitely one of my better finds. And a shock. Why does this book even exist? Who thought a surreal interpretation of Kermit's anthem was the next logical step for the song? Jim Henson made many experimental films that touched on the absurd, so Delessert's work isn't completely out of left field. 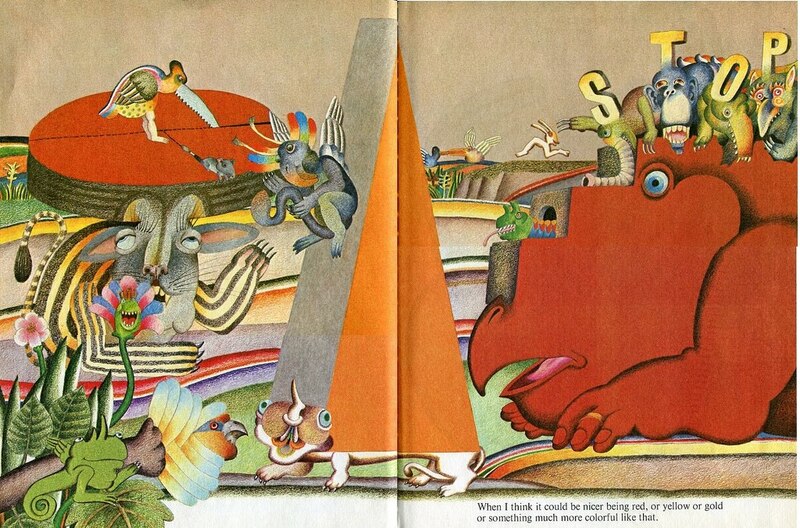 But even for 1973, really, how was this a Sesame Street book, an "educational product," no less? Of course, it's eerily brilliant. And it turns the song on its head in a lot of ways, which perhaps turns our world on its head as a result. 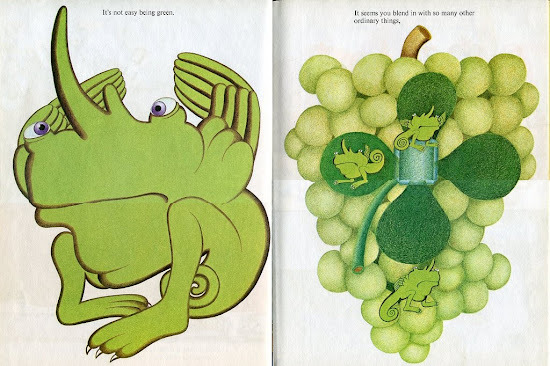 In Delessert's vision, no one fits in with anyone else, so it's not clear that being green puts you at a much larger disadvantage than being red with steps on your face or a split melon with legs. 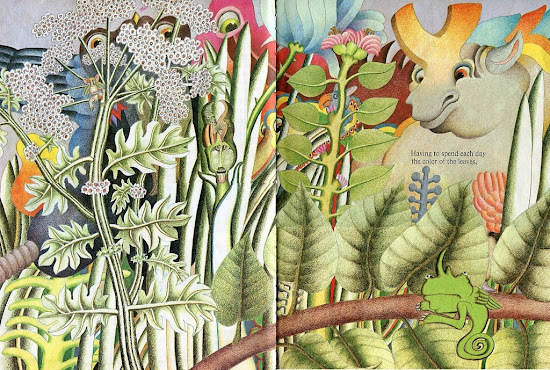 Now, perhaps Delessert's depiction of the world is supposed to represent the way the green creature (which is not a frog) sees the world as an outsider. 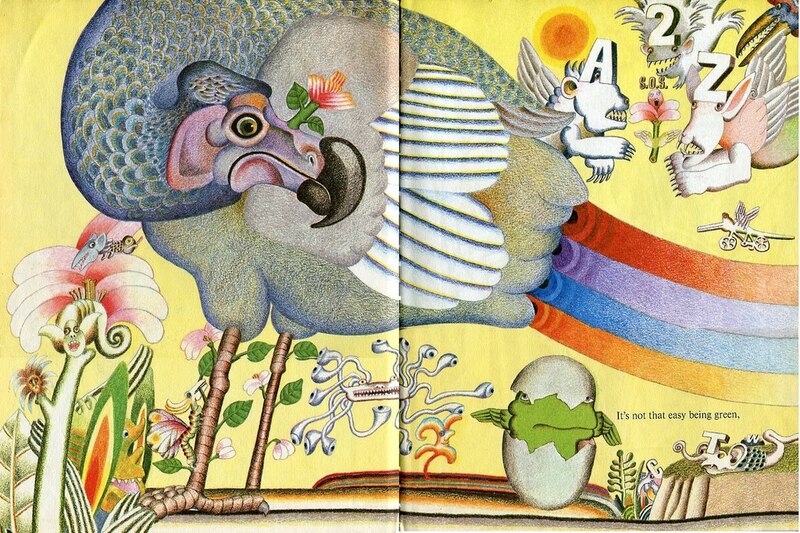 But when the song takes the turn, and the creature embraces his greenness, it allows him to stand away from the world on his own, elevated and visible (as opposed to small and hidden), but the crazy Delessert world is still there, off in the distance. 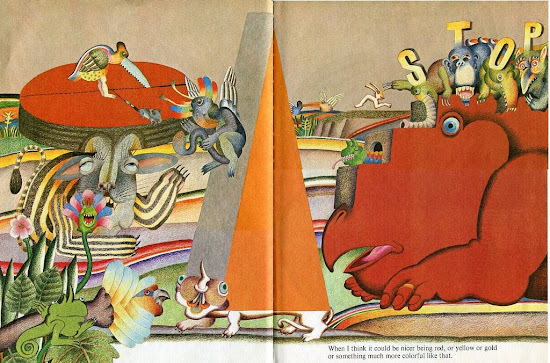 And on the last page, the creature is in the process of eating all of the other colors, suggesting perhaps that all of the colors live in him? (But isn't there something rather Monty Python about that last page? Like he just ate the whole world in one boot-stomping go?) I had hoped in writing this, I'd unlock the sub-textual meaning, but I'm still at a loss. My daughter loves it. Not loves it, like asks for it all of the time, but it's definitely been in heavy rotation at times. Then she gets out my old Sesame Street double-LP The Anniversary Album to play Bein' Green, which she then tries her best to sing. (Why was the title of the book Being Green while the song is always Bein' Green? Another quandary.) I don't know what the book means to her, but it doesn't seem to perplex her any. "RAPOSO and DELESSERT have combined their talents on another project to delight children. 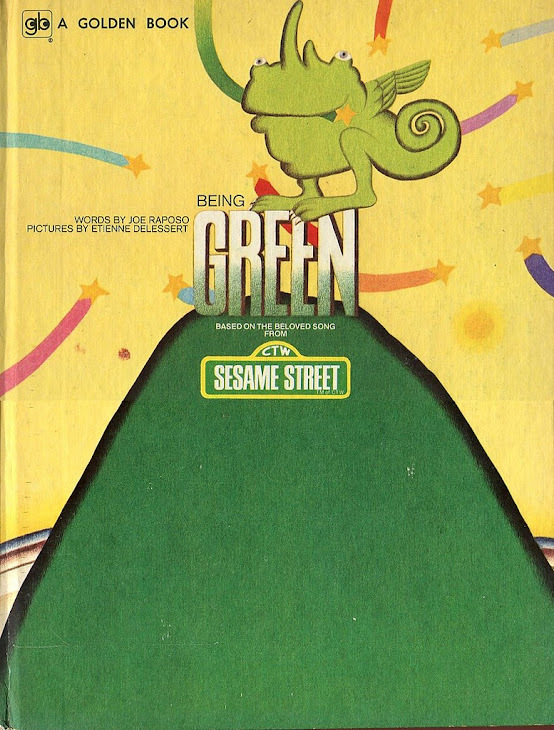 Mr. Delessert has produced an animated film, based on the background and characters of this book, to the sounds of Sinatra singing Bein' Green. See it on Sesame Street." Where can I see this video! YouTube fails me. The internet fails me! Please, someone, have this video somewhere on tape or wherever and post it online. Then let me know, and I'll let everyone else know. Crowdsource this now. One last thought: The flora throughout the book reminds me of Leo Lionni's Parallel Botany. I don't have anything more to say to that, but it seemed worth noting. 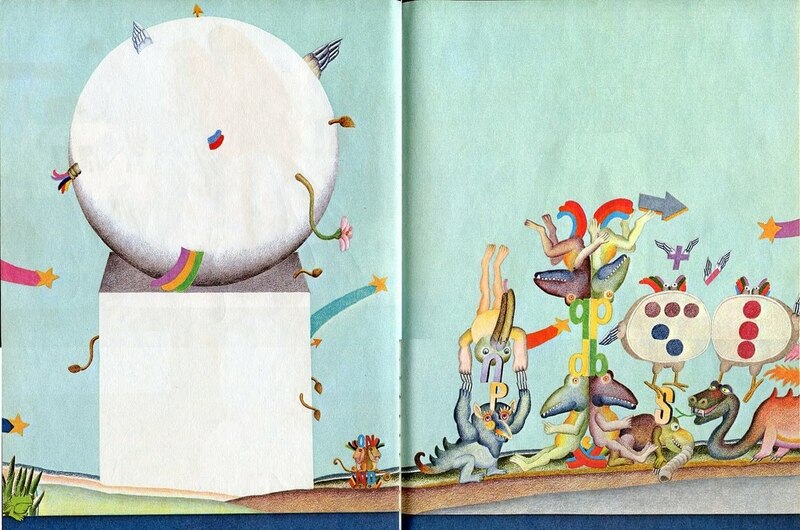 For anyone interested in seeing the whole book, head over to my Flickr set, here. The book measures 12.5" by 9.375", which is way larger than my scanner bed. As a result, I had to do each two-page spread as four separate scans that I then put together using Microsoft Paint, since that's the extent of my computer graphics know-how. So you'll see the seams between the scans in a bunch of these, but it was the only way I could get it done. This book really needs to be seen in entirety to begin to understand it. And if you want to learn more about Delessert's collaboration with Ionesco, check out my interview from last month, here. GOOD LORD! This is amazing! Delessert is the greatest, and the Muppets are also the greatest, this is like a pizza with a birthday cake on top! Words are obviously failing me, just, ugh, WOW! that's what i thought, but the muppet wiki states the pinball sequence "were produced and animated by Jeff Hale's Imagination Inc. The animation was directed by Hale, who also developed the concept and design for the segments. The actual animators included Ernie Fosselius. The animation recalls contemporary psychedelic and pop art styles, typified by the ornate pinball bumpers, colorful geometrical motifs, and whimsical themes and devices inside the machine." Chandra... my son has insisted on watching Being Elmo TWICE. weird, right!?! the apple doesn't fall too far from the tree I guess!